In 1826, Francisco De Paul Gonzales was born in Guanajuata, Mexico. Both his father and grandfather served as officers in the Spanish army. After the death of his father in 1835, he moved with his mother, Rita, and younger brother, Thomas, to New Orleans. Rita sent the two boys to a small Mississippi River settlement in Illinois for school, before they completed their education in their ancestral hometown in Spain. 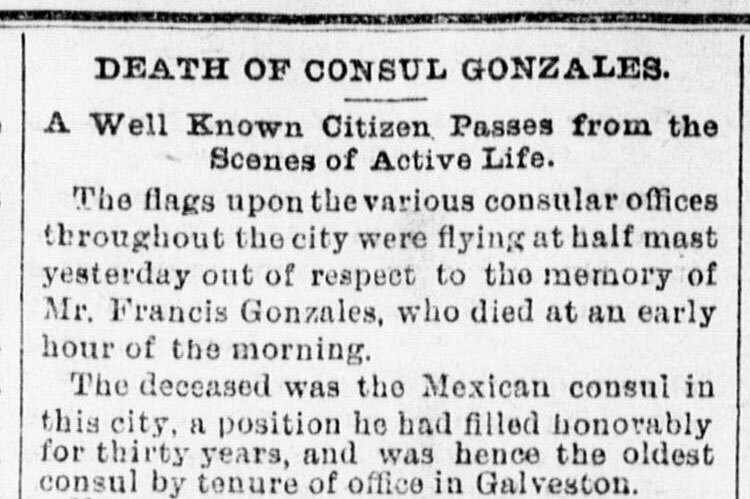 Afterwards, Gonzales returned to the United States traveling throughout the Gulf Coast region in his early career. He served as the head agent for an English importing house’s operation in Brownsville, Texas facilitating trade with interior Mexico. While there, he married Martha Anne Rhea and together they had five children. The Gonzales family moved to Galveston in 1854 where Francis worked as a commission merchant on the Strand selling a wide variety of items imported through the harbor. Two years later, he was appointed to Consul of Mexico and Spain. He resigned his a position with Spain after twenty two years, but kept his consular appointment to Mexico the rest of his life. In 1859, he bought out a grocery and western produce store on Strand just west of Tremont Street; however, its opening was delayed until after the Civil War. In the 1870s, he purchased property at Broadway and 19th street and built a house for his family. When his wife Martha died in 1874, Francis withdrew from business and dedicated himself solely to his children and his work as Consul. He never remarried and when he died in January 1890, people remembered him as being a particularly devoted father.